One of the most basic aspects of trapping wild animals is that using a bait in the trap, whether it be a lethal trap or a cage trap, will help your trap to be more likely to catch the animals that you are targeting. The range of bait that can be successful in the trap will range from common foods that are found in most kitchen cupboards, through to commercially produced bait that is said to be very successful. The most important thing to remember is that not all animals will respond to bait in the same way, and it is vital that you tailor your trap and your bait in order to match the wild animal that you are trying to catch. The most simple reason that most people will choose to set a bait when they use an animal trap is that it will usually increase the chances of catching the target animal. The reason for this is that not all traps are especially subtle, so the bait will not only draw the animal into the trap, but it will also help to distract the animal from its natural wariness of the man made trap. This is vital if you are to successfully catch the animal, and par - ticularly with animals that have become trap shy, or are especially clever or elusive, the bait can be the difference between the trap being successful or failing to catch the animal. The most common type of bait that will be used by the majority of trappers will be food, either fruit, vegetables, meat, or in some cases a mix of different types of food to try and attract a particular animal to the trap. There are also commercially produced baits available, and these will usually be designed to target a particular species, and they can be worth trying if you aren't finding success using traditional bait. The third type of bait is poison bait, and in most cases this is worth avoiding, as it will be difficult to locate the carcass once the animal is dead, and as it is very toxic it can also harm children, pets, and any other animals that come into contact with it. One of the most common foods to be used as bait is meat, and this will usually be successful with most animals that eat meat, such as raccoons, rats, coyotes and bobcats. This can be food such as chicken, rabbit or even canned cat food, while some people will choose to use meat that has turned bad so that the scent is stronger and more likely to attract the animals to the trap. Vegetables are good for catching groundhogs, opossum and woodchucks, while peanut butter is generally a very good bait that can be used for most animals that eat fruit and vegetables. One of the most important aspects of choosing your bait is to bear in mind the location of your trap. If you are placing the trap indoors, then it is probably best to avoid anything that is too strongly scented, such as rancid meat or fish. If the trap is due to be placed in a location where it is open to the elements, then trying to avoid anything that is likely to be washed away or diluted by rain. Also, try to avoid placing the bait in some kind of container that can be tipped over off the trap, or that can be reached without entering the trap, otherwise you could end up giving a free meal to a clever animal. The fact of the matter is that like people and our pets, not all animals will have the same tastes, and while one bait may be very successful at catching a particular animal, sometimes even members of the same species won't be attracted to the same food. If this happens, then it is best to try different baits on the trap, to see if you can be successful with different types of food. The location of the trap is very important, so when it comes to placing your trap, it is best to try and find a location that is close to the entry or exit point that is used by the animal regularly. In some cases, animals may be 'trap-shy', where they have been caught before, and have an increased wariness of the trap itself. If you suspect this is the case, pre-baiting can be a successful tactic, as it involves laying out food for the animal over several days, and then one day setting out the food in a trap, and as the animal will have come to see the food source as safe, it can be more likely to be caught. 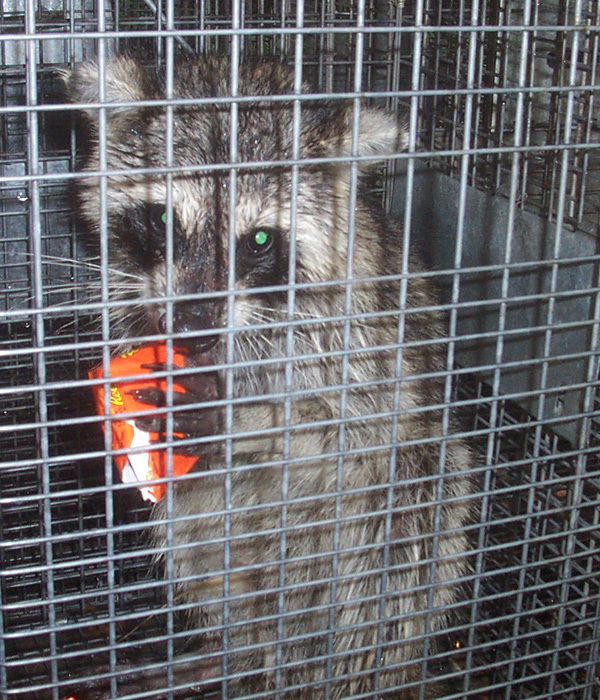 Go back to the main How to Get Rid of Wild Animals page for more information about animal trapping and information about What Is The Best Bait To Catch A Wild Animal in a cage trap.